The sun is shining and you’re about to make the responsible choice to slather on some sunscreen to protect your skin from the sun’s harmful (but also warm and wonderful) UV rays. Even the smell of sunscreen elicits summertime nostalgia for many of us. However, safety concerns have been raised regarding some of the most common ingredients in traditional sunscreens. It’s an unfortunate paradox: protect yourself from skin cancer and expose yourself to the harmful ingredients in the sunscreen or forego the sunscreen and potential chemical exposure to roll the dice with UV ray-related cancers like melanoma. Thankfully, there is a growing body of toxicity data to help guide decision-making when choosing how to protect your skin from the sun! What’s wrong with my sunscreen? Many of the most popular ingredients in sunscreen have received scrutiny for their toxicity towards humans and the environment. Oxybenzone is the compound that has achieved the most notoriety thus far after it was reported that it can be found in the blood of nearly 100% of Americans, including in breastmilk. Oxybenzone is a common ingredient in sunscreen because it absorbs damaging ultraviolet (UV) rays and is considered to provide broad-spectrum coverage, meaning it can protect skin from both UVB and short-wave UVA rays. Not only is oxybenzone exposure ubiquitous, but this chemical is also capable of disrupting hormone signaling in humans and is a common skin allergen for sensitive populations. Other common ingredients, such as octinoxate and homosalate, are also detectable in breastmilk and have both been reported to similarly disrupt hormones in humans. A handy visual guide adapted from Environmental Working Group (EWG) showing the toxicity rankings of common sunscreen ingredients. In addition to these human health concerns, there are also important environmental concerns to take into consideration. A recent review of the literature reported that common sunscreen ingredients (oxybenzone, octocrylene, and octinoxate, among others) are detectable in nearly all water sources sampled from around the world and these chemicals are extremely difficult to remove from the water via traditional wastewater treatment. These chemicals have been detected in aquatic wildlife and have been linked to coral bleaching. In fact, Hawaii and Florida have recently passed legislation banning the use of sunscreens containing chemicals like oxybenzone to help protect precious marine ecosystems as well as improve human health. Is sunscreen worth the risk? YES. An estimated 1 in 5 Americans will develop skin cancer by age 70 and regular daily use of sunscreen that is SPF 15 or greater reduces the risk of developing melanoma by 50 percent. While the risks associated with some of the active ingredients of sunscreen are not ideal, it is probably better than foregoing sunscreen altogether. However, there are sunscreen-free options for protecting yourself from UV damage. For example, wearing SPF-rated long-sleeved clothing and wide-brimmed hats or simply avoiding excess sunlight exposure whenever possible can be lifestyle changes that reduce the need for sunscreen usage. It is important to note that both protective clothing and avoiding sun exposure can only do so much to protect your skin and that there will always be circumstances under which sunscreen is the most appropriate skin protectant to implement. So what kind of sunscreen should I be using? Sunscreens impart their UV protection through two main mechanisms: chemical and physical. Most of the troublesome sunscreen ingredients are chemical barriers to UV rays. The sunscreen ingredients that impart the best UV coverage and act as a physical barrier are mineral-based, like zinc oxide and titanium dioxide. So far, the existing toxicity data suggest that zinc oxide and titanium dioxide sunscreens are relatively safe for us and for the environment! Here is a visual guide to UV protection based on the sunscreen ingredients, shared from Reef Repair. For more information to help your decision making on sunscreen protection, visit EWG’s page for a comprehensive guide! Peer edited by Julia DiFiore. Spring is officially here, so it’s time for some science about some of the most adorable baby animals. In my past training as an animal scientist at UC Davis, spring was largely marked by births within all the herds at our campus animal facilities. As a teaching assistant for the Animal Science department, I enjoyed interacting with these new additions and teaching future animal scientists how to safely practice animal husbandry. Considering the proximity of this post to the start of spring, I thought it fitting to discuss some of the history behind our most beloved spring animals and how they’ve contributed to science. Be the hit at your next cocktail party (or perhaps an Easter brunch) with these fun facts! Rabbits and hares may be some of the most iconic symbols of spring, and they’re probably best associated with the season through tales of the Easter bunny. According to folklore, the hare was the sacred animal of the Germanic goddess of spring, Eostre. There are multiple legends through which Eostre is believed to have created the Easter hare. In one version, Eostre transformed a bird with frozen wings into a rabbit, allowing the resulting animal to retain its ability to lay eggs. In another version of the legend, Eostre became annoyed with a bird which prided itself on laying the most beautiful eggs, so she transformed the bird into a rabbit; in a moment of mercy, she allowed the rabbit to lay its eggs once per year, in the spring. No matter what you believe, it’s undeniable that rabbits and spring are a classic combination, and rightfully so, as their rapid proliferation easily casts them as symbols of fertility. Rabbits are often associated with spring through tales of the Easter bunny, but their biology also aids scientific discovery! Rabbits are extremely prolific. In terms of their reproductive behavior, rabbits are classified as induced ovulators, meaning they ovulate after sexual stimulation. Rabbits also have a relatively short gestation, or pregnancy, lasting about 28-32 days. This short gestation period in addition to induced ovulation means that a reproductive female is capable of giving birth, or kindling, a new litter of kits as often as once per month. Over the course of one rabbit’s seven-year lifespan, a single female and her female descendants could produce over 100 billion new female rabbits! It’s no wonder these animals are associated with spring, a season marked by new life. Besides their connection to spring, rabbits have also contributed to science as important model organisms. Rabbits provided the first model for cancer caused by a virus, which has been crucial for better understanding how human papillomaviruses (HPVs) cause cancer and in the development of vaccines against HPV infection. 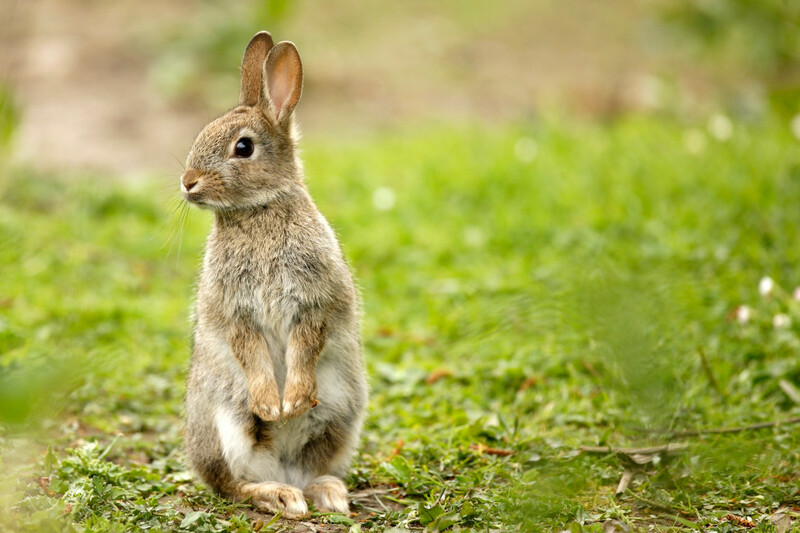 In addition, rabbits are commonly used to produce antibodies for laboratory use, such as for immunology and infectious disease research. Rabbits were also used in the development of certain vaccines, including the rabies vaccine, and surgical laser technologies. Finally, their physiology makes them ideal for studying several of the diseases plaguing humans, including cholera, cystic fibrosis, eye and ear infections, and non-infectious conditions such as those resulting from high cholesterol. Chickens and the eggs and chicks they produce also hold special significance for the spring season. Similar to rabbits, chicks and eggs have been regarded as symbols of spring, reproduction, and new life, even in civilizations as far back as ancient Rome. In Catholicism, eggs came to be associated with spring, and particularly Easter, though the practice of Lent. Traditionally, fasting practices during Lent excluded the consumption of all animal products, including eggs. As lent ends with Easter, spring may additionally be associated with an abundance of eggs as a result of the holiday. Another reason why chicks and eggs may be particularly associated with spring could be due to the unique laying cycle of hens. The avian reproductive cycle is stimulated by increased hours of daylight, as is characteristic of spring time. More specifically, light passing through the eye or skull of birds can be received by photoreceptors in the hypothalamus, which then activates the pineal gland, which in turn triggers the hormonal cascade that results in the production of eggs. If those eggs are fertilized by the passing rooster, then increased daylight hours mean more cute, fuzzy chicks! In nature, hens lay eggs more frequently with increasing light hours. This means that spring brings more cute (and sassy?) chicks! 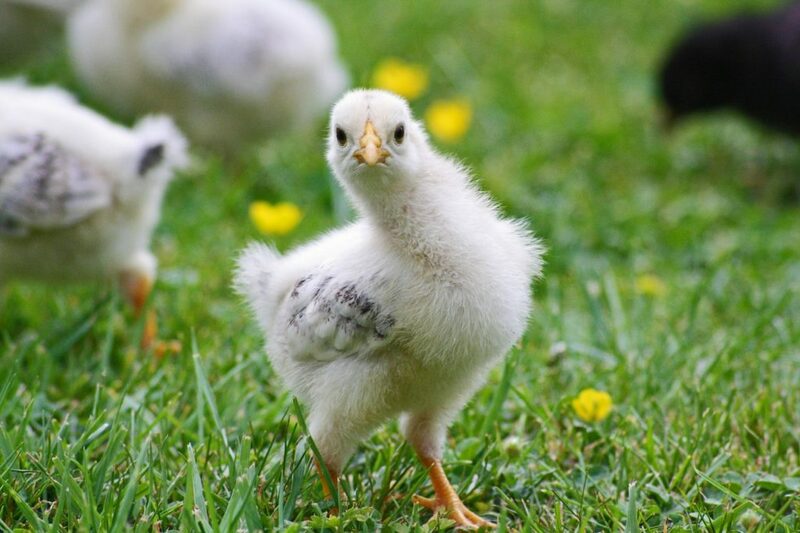 Aside from the chicken’s ubiquitous use as an agricultural animal, chickens and their eggs have also helped scientists in the biomedical field! Eggs are the most common means of producing flu vaccines; the flu virus may be injected into eggs, allowed to replicate, and after several days these viral particles can be removed from the egg and heat inactivated to produce new flu vaccines. Current research with genetic engineering technologies has expanded the contribution of chickens to science, as researchers at the Roslin Institute in Scotland have now produced birds capable of producing and secreting medicinal antibodies into their eggs. These antibodies have the potential to treat diseases including melanoma and multiple sclerosis. Finally, near and dear to my own heart, are lambs (young sheep) and kids (young goats). Having raised sheep in high school and performed research with goats and goat milk while working towards my Master’s, I relish any chance to talk about them. 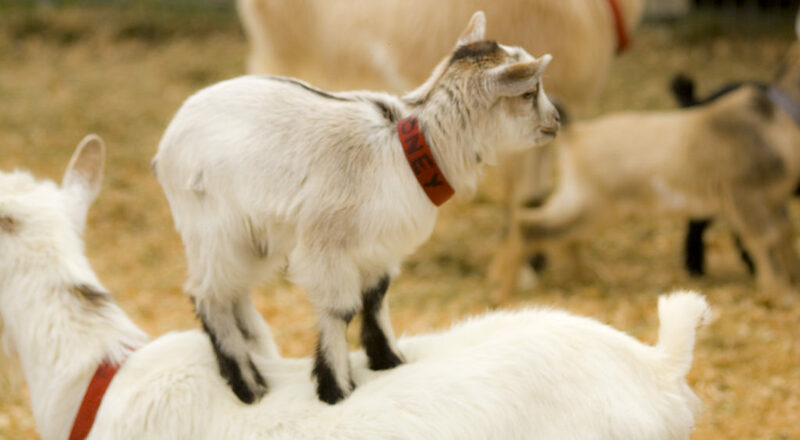 While lambs are a frequent biblical symbol associated with Easter, goats are a similar species also born in the spring, and goats have become quite the rage nowadays with activities such as baby goat festivals, goat yoga, goat party rentals, and even goat-kart races! Everyone is raving about goats these days, and it’s easy to see why! Who wouldn’t want to spend a beautiful spring day with these rambunctious cuties? Within minutes after birth, lambs and kids are capable of walking, and one of the first items on their mind is food! Lambs and kids are both classified as ruminants, which means they have a specialized digestive system to help break down a plant-based diet. Ruminants have a single stomach with four compartments: the reticulum for temporary storage and size-sorting of feed, the rumen with its vast microbial population for fermentation of fiber, the omasum for water absorption, and the abomasum, which is akin to our own acidic stomach and helps with the chemical breakdown of food. 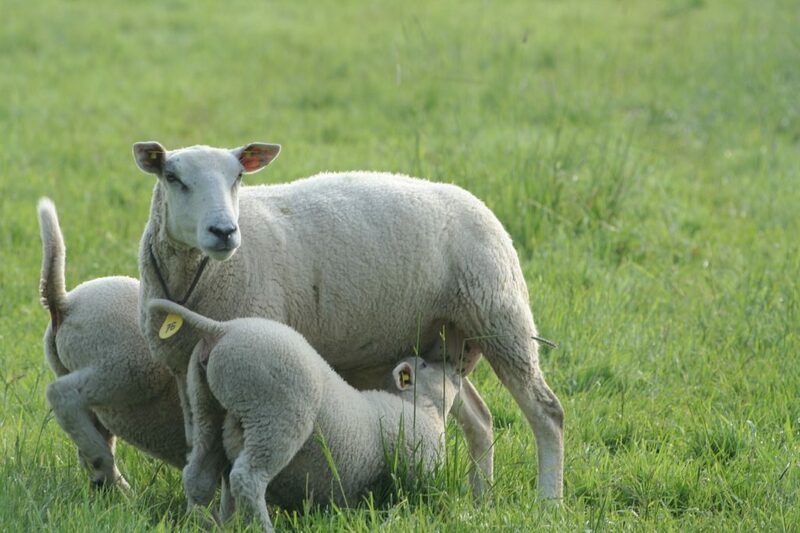 Because lambs and kids are mammals like us, they solely consume milk for the first few weeks to months of their life. However, the microbial population in the rumen can potentially alter the nutrient composition of the milk and reduce its nutritional value for the offspring. So how do baby goats and sheep get around this hurdle? They have a specialized structure in early development, termed the esophageal or reticular groove, which bypasses the microbes within the rumen and allows milk to be broken down and digested directly from the abomasum. Isn’t that neat? Ruminants are the coolest! Young lambs enjoying a meal from mom; ruminants like sheep and goats must use specialized digestive structures early in life to maximize the nutrition they receive from milk. Sheep and goats have also been crucial contributors to science. The aforementioned Roslin Institute is responsible for the first cloned mammal, Dolly the Sheep. 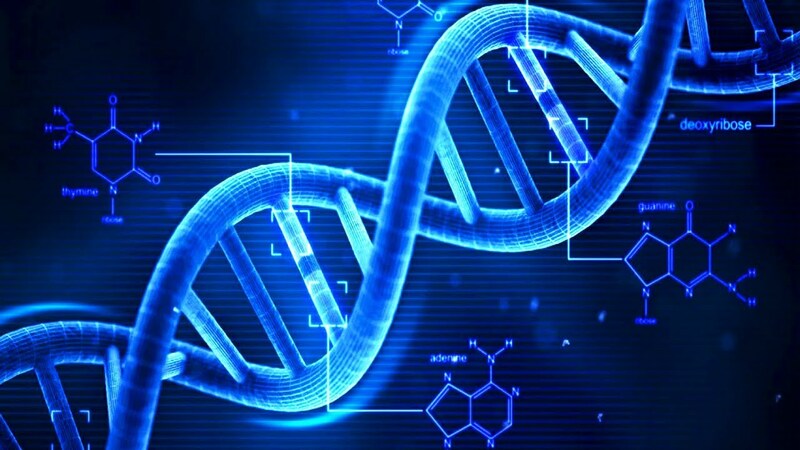 Cloning of the first mammal helped pave the way for other genetic modifications in livestock. In previous years, milk from genetically engineered goats has been produced to include supplemental antimicrobial enzymes, such as lysozyme, in efforts to fight childhood malnutrition and diarrhea. Today, genetically engineered sheep are potential candidates for human organ generation due to their similar size and physiology to humans. While spring is a time to enjoy the company of new furry, feathered, or woolen companions, it may also be a time to reflect on how all these species have contributed to science and the wellbeing of humans. So the next time you go to the grocery store to support your favorite animal industry, go to an event at your local farm, or attend your favorite goat yoga class, know that your efforts also support science! Peer edited by Gabby Budziszewski. Toxins are everywhere these days. In your water, in your food, in your beauty products, in mostly everything you consume or surround yourself with. Most importantly, toxins are in the headlines. The media has done a great job sensationalizing many toxicology papers and creating eye-catching headlines, like mine, that are not necessarily correct. Earlier this year, USA Today released an article titled “Oral-B Glide floss tied to potentially toxic PFAS chemicals, study suggests” and Medical News Today released a similar piece titled “Flossing could increase exposure to toxic chemicals”. These were all based on a recent article published using self-reported data from the Child Health and Development Studies in Oakland, CA. Due to the media sensationalizing this study, it is important to break down the headlines and understand what was actually said and done. Figure 3. Structure of PFTE: a polymer PFAS. n signifies that this basic chemical unit is repeated multiple times to form a polymer. The toxins of focus in the article, as the USA Today headline states, are PFAS. PFAS, short for per- and polyfluoroalkyl substances, are man-made chemicals that have been used in industry and consumer products for nearly 70 years. PFAS are fluorosurfactants which are a group of chemicals whose properties originate from a substitution of hydrogen with fluorine along the carbon backbone. PFAS include chemicals like PFOA, PFOS, and GenX and can be found in non-stick cookware, water-repellent materials, some cosmetics, food packaging, and products that resist grease, water, and oil. PFAS encompass many substances and the EPA has a list that includes over 5000 PFAS substances. The PFAS substances can be divided into two major families: polymer and non-polymer. Polymers and non-polymers are differentiated from each other by size, with polymers being a chemical made of many repeating units of non-polymers. The non-polymer PFAS include PFOA and PFOS and are the most commonly detected in the environment. The polymer PFAS are larger molecules than the non-polymer substances and include PFTE. In the study described, they measured a total of 11 non-polymer PFAS (including PFOA and PFOS) in blood samples in 178 middle-aged women and collected data on behaviors that they believed would influence PFAS exposure. These behaviors included using things like non-stick cookware, microwave popcorn, glide floss (Oral-B), coated cardboard containers, seafood, and stain-resistant carpet and furniture. This is the first paper to consider dental floss as an exposure to PFAS. To narrow down the brand and type of floss, the researchers did something interesting. They analyzed 18 different floss types for the presence of fluorine and used it to evaluate the plausibility of PFAS exposure from dental floss. They found Oral-B Glide dental floss and two other dental floss products to have detectable levels of fluorine. Fluorine is a chemical that is represented by the letter F on the periodic table of elements. We commonly know it as fluoride, which is made when you combine fluorine and a metal, like sodium. Fluoride can be a common component in many of our dental products, although Oral-B’s website does not specify whether their Glide floss contains any. They do have an instructional page that takes you through the different types of dental floss, where you can see a very familiar looking word: polytetrafluoroethylene (PTFE). PTFE is the most commonly used chemical for Teflon coating and is in the polymer family of PFAS which is not the same class as PFOA and PFOS (these are non-polymers). The article does take notice of the report that Oral-B Glide is manufactured from PTFE; however, it is confusing why they chose to evaluate PFAS non-polymer exposure when the Oral-B Glide Floss is made with PTFE which is a PFAS polymer. It is particularly perplexing since the studies that describe the toxicity of PTFE are few in number, in comparison to PFOA, and the results do not present substantial conclusions. This is when a little chemistry knowledge is needed. PFOA is commonly used in the synthesis of PTFE and is an established dangerous chemical. Additionally, PTFE may also contain PFCA (another type of PFAS). The studies done to assess the presence of these PFAS in PTFE were done with non-stick pans while applying high levels of heat to see if PFOA and PFCA gases were released. It seems a stretch to imagine that dental floss would undergo enough heat to release these more dangerous toxins and thus contribute to the circulating levels of non-polymer PFAS. 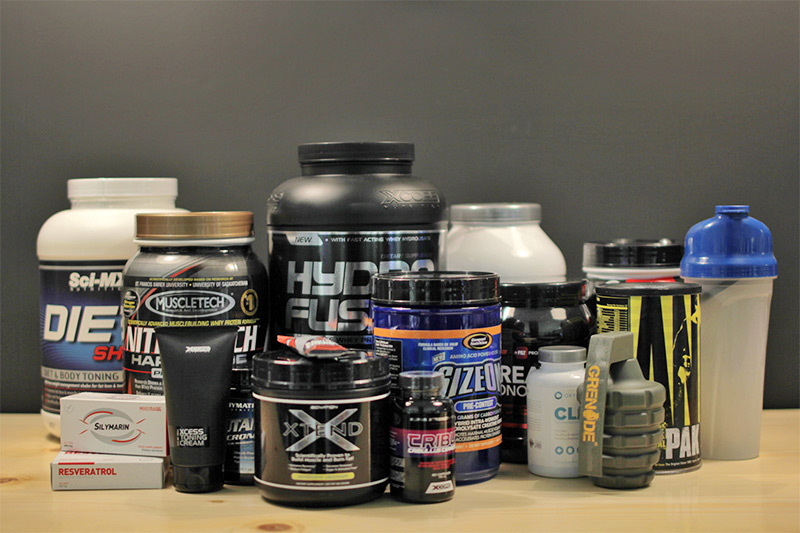 However, it is possible that PFTE, when metabolized by the body, breaks down into these more toxic metabolites. It is mentioned in the discussion of the article that “PFASs are detected in PTFE-based dental floss…” and cites two papers. One of the papers clearly shows that PFOA was detected in both dental floss and dental tape. However, the concentration is minute in comparison to PFTE cookware, PFTE film/sealant tape, and popcorn bags. There is one main thing to keep in mind from this seemingly damning paper. It is unclear from their methods how they measured the PFOA in the dental floss/tape, but it is clear that it was not under circumstances that would mimic human use. The researchers for this paper note that since “…PFTE does not dissolve…” you have to measure PFOA presence by extracting from a ground or powdered material. All in all, it is important for studies to assess the potential sources of exposure and hold industry accountable. 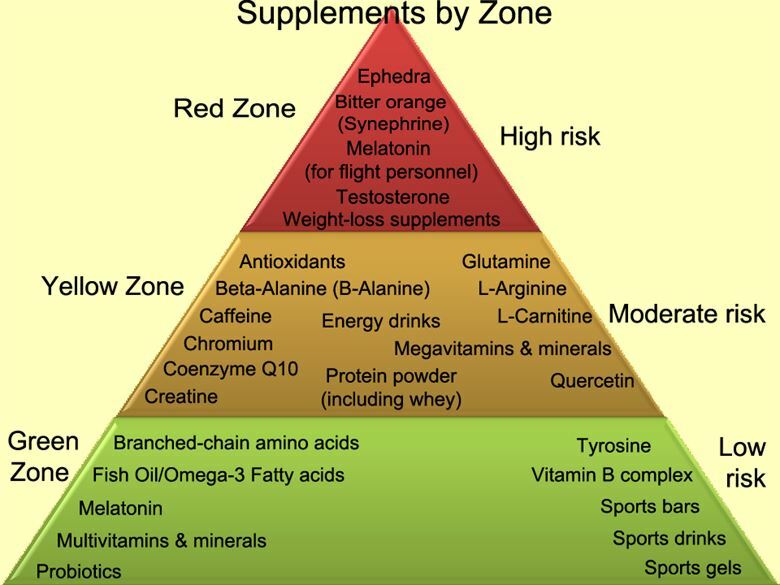 However, it is important when evaluating new sources of exposure to be sure that the exposure in question could be significantly contributing to your toxins of interest. For the case of Oral-B Glide, it is possible that the PTFE used in this dental floss is contributing to elevated levels of PFAS in people’s bloodstream. Nevertheless, we currently do not have the research to support this connection, and so it is important to be mindful with our results and not let the media sensationalize them. Peer edited by: Isabel Newsome and Nicholas Martinez. Have you ever marveled at a gecko climbing on glass? Or wondered why mosquito bites are painless unlike the injections we get at the doctor’s office? The natural world has developed some ingenious features during the ~3.8 billion years of its evolution. However, until quite recently, humans weren’t taking full advantage of the ‘inventions’ of nature. Engineers and scientists work tirelessly to develop high tech solutions to everyday problems. Sometimes however, ‘getting back to nature’ is the way to go – enter the field of biomimicry. Biomimicry, also called biomimetics, uses the natural world as an inspiration for innovative solutions. Instead of developing something brand new, we are more closely examining the natural world and then mimicking its properties for our benefit. 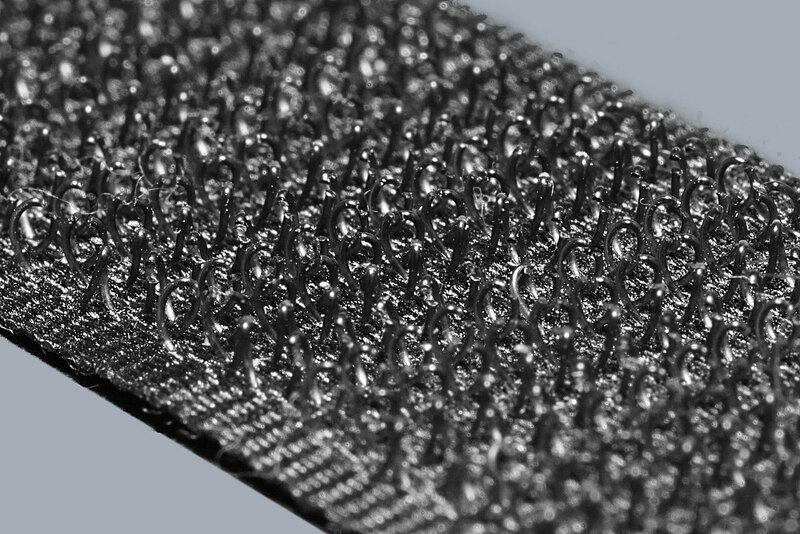 One of the earliest examples of biomimicry is velcro, a common component of clothes and other accessories. 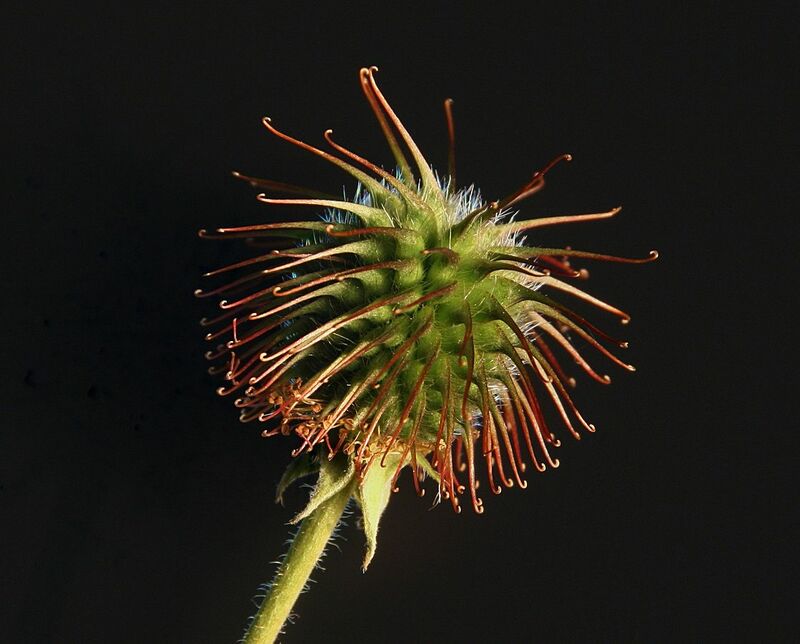 Velcro was developed by a French engineer to mimic a bur, a little seed with hooks that he picked off himself and his dog after a walk. Biomimicry experienced a boom after the release of a book called Biomimicry: Innovation Inspired by Nature by Janine Benyus in 1997. 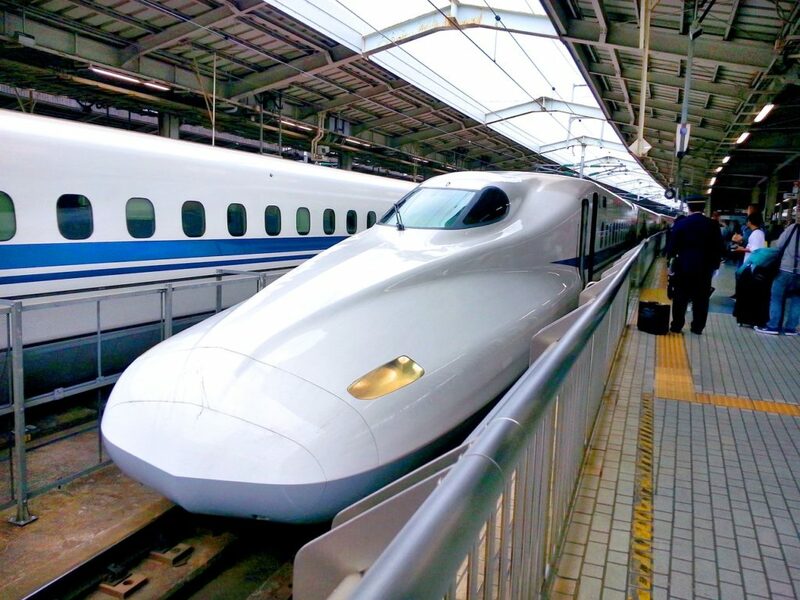 The super fast bullet train Shinkansen in Japan was designed using concepts of biomimicry. Although engineers didn’t have trouble achieving the desired high speeds, the trains produced large amounts of noise when entering/exiting tunnels. The shock wave produced was enough to structurally damage several tunnels. The redesign of the front of the train was inspired by the beak of a kingfisher. 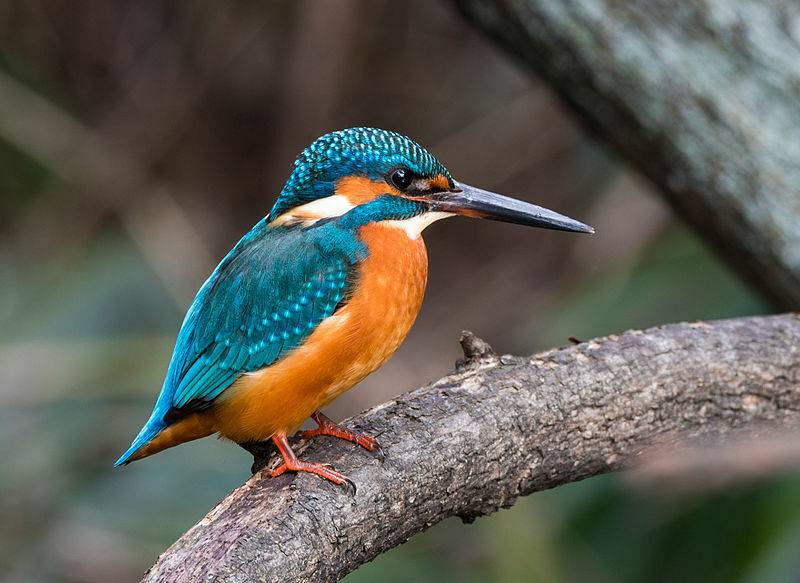 The kingfisher is able to enter water almost without splashing because of the streamlined shape of its beak. Application of this knowledge to the Japanese trains solved the issue of shock waves while also increasing speed and decreasing use of electricity. What is the future of biomimicry? There are many possible applications still out there and several technologies currently in development. German researchers are working on a robot that resembles a spider. While spiders scare many of us, these spider-like robots could be used to enter spaces unsafe for humans to accomplish important tasks, such as searching for survivors after disasters. Another interesting project is being pursued by scientists in Japan who are developing a needle based on the the mosquito proboscis (mouth) that would slide into skin painlessly just like a mosquito bite. 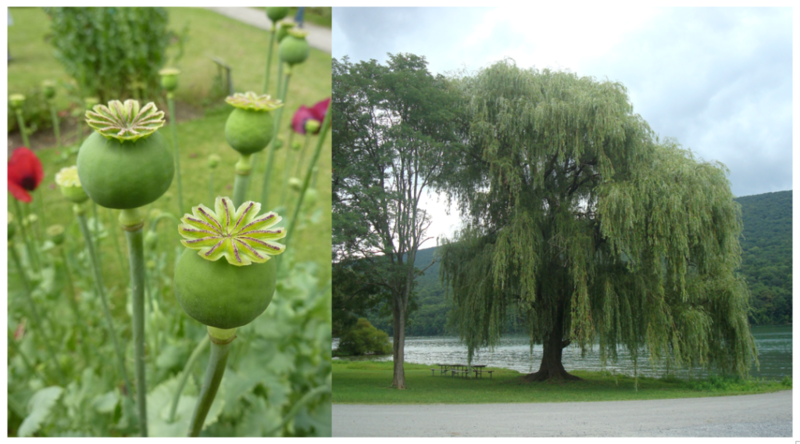 The potential to use nature as a template for development of new technologies is exciting. We may find previously elusive solutions by harnessing the power of nature, which has evolved for much longer than humans have been on this planet. Biomimicry strives for sustainability because “…the only real model that has worked over long periods of time is the natural world.” (Janine Benyus, author of Biomimicry: Innovation Inspired by Nature). If you want to learn more about biomimicry, I recommend checking out the Biomimicry Institute, a non-profit organization that is a driving force in the field of biomimicry. When feeling under the weather, we commonly end up sitting in a doctor’s office chair. Blood and saliva samples are whisked away to a room filled with instruments, some as big as a washing machine. In this room technicians run a litany of tests that can take hours or days for results to come through. These medical laboratories and the tests they provide have evolved from pregnancy testing in ancient Egypt that measured urine’s ability to germinate seeds to the now ubiquitous blood workup at a yearly physical exam. For patients, getting tests done at a doctors office hasn’t changed drastically in the last few decades, but there’s an evolution occurring where these tests and instruments are getting miniaturized. This growing field of shrinking laboratory instruments is called “lab on a chip” technology. When people say chip, it means many of these technologies are built handheld pieces of glass, plastic, or even paper. By shrinking computers, digital computing technology revolutionized our world, fitting into places previously unheard of such as cars, ovens, and phones. When it comes to shrinking a lab instrument, the benefits take a different shape. At first thought, using paper to perform medical tests seems rudimentary compared to the whirring computers in a high tech hospital lab. By removing electricity and the expensive complex components, paper-based tests are more affordable and highly mobile. Paper-based tests are often more rugged and compact, which makes their transport and use outside of the hospital plausible. In fact, a paper lab test can be bought in corner pharmacies today. The at home pregnancy test is an example of a paper based test. Many of these tests measure the amount of a hormone, human chorionic gonadotropin (hCG), in urine. This hormone is only present in urine when the patient is pregnant. These tests function by using the paper to wick the urine across several key regions that facilitate the measurement of hCG. First, the paper moves the urine across hCG antibodies, molecules that will only attach to hCG, with tiny colored beads attached. 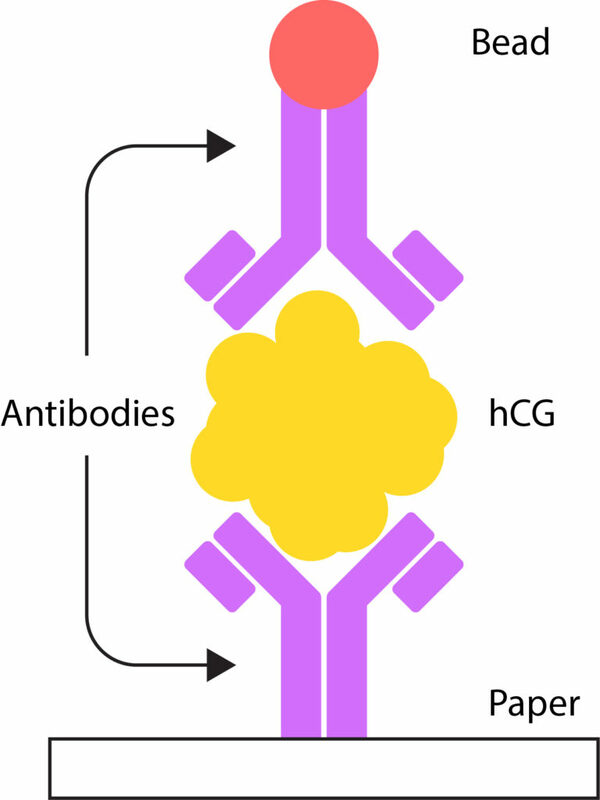 The antibodies that captured hCG are then carried over a second bed of antibodies attached to the paper. This creates a “sandwich” with paper acting as the plate, antibodies as the bread, a filling of hCG, and a colored bead garnish. The sandwich shows up as a thin line of color only if the urine holds hCG confirming the user is pregnant. Researchers at the University of Washington are expanding the use of paper for diagnostics by developing a test for malaria. Similar to the pregnancy test, this device uses lateral flow to move sample around, but a key difference is this study uses dissolvable sugar to delay the delivery of certain samples. These delays are necessary for measuring malaria; in the pregnancy test only one reaction step occurs, but the researchers are using malaria as an example of an application that requires multiple steps to make a measurement. In this multi-step device, all the samples are delivered at different times automatically because the researchers are able to control how long it takes the sugar to dissolve. Controlling how fluids move on paper automatically enables increasingly complex tests to be run without adding any mechanical components. Where paper devices have shown their use in relation to diagnosis, there are other scientists trying to make chips that mimic human organs. In the future this sort of device could allow doctors to test which drugs would be easily absorbed in a patient’s intestine by using a chip that has their own gut cells. By performing these tests on a patient’s actual cells, doctors can avoid prescribing drugs that are ineffective or even harmful to a patient . Researchers at the University of North Carolina at Chapel Hill gathered intestinal cells during gastric bypass surgery, with the patient’s consent, to make an intestine chip with the patient’s’ own cells. To grow the cells in the lab, researchers add growth factors, chemicals that tell cells how to grow correctly, and give the cells a carefully tuned surface to grow on. In the laboratory setting, hard plastics are often used to cultivate cells, but this is not a natural environment for cells, which are used to being surrounded by a soft support infrastructure inside the body. In this work researchers made a soft mold that mimics the shape of the intestine and provides a more natural surface for the cells to grow on. Using this technique the researchers were then able to make a chip that not only looks, but also and acts like our intestines. With devices like this intestine on a chip starting to appear, there is hope for changes in the way drugs and other therapeutics can be developed. For example, much of drug efficacy testing occurs in mice. Although mice are mammals, which makes them similar to humans in some ways, they are also very different from humans. Frequently drugs that look propitious in mice turn into let downs when tested in human clinical trials. Therefore, by testing drugs on actual human cells early in the development stage mouse lives are spared and the initial investigations are more representative of the final use in humans. With “on a chip” technology, the way we approach medicine may look very different to the medicine of today. Waking up at home feeling under the weather, you may go into your medicine cabinet and grab your home diagnosis kit. You swab your cheek with a q-tip and insert the end into a credit card sized chip, you press a button allowing the fluids to flow through the chip and after 5 minutes you have your diagnosis- it’s strep throat. You message your pharmacy, take a picture of your test results, and receive a notification that your medicine will be ready in a half hour. The medicine you receive was developed through organ on a chip testing and no laboratory animals were used during any stage. Going to the doctor’s office for something as routine as strep is practically unheard of. With the work going into chip technologies, this imagined future may soon become our reality. Peer edited by: Elise Hickman and Matthew Varga. March Madness has arrived, which means my alter ego – the one that worships Coach Roy Williams, mumbles curses against Zion, and says words like “offensive rebound percentage” – has officially been unleashed. As I fervently check my NCAA bracket and get misty eyed at the mention of graduating senior Luke Maye, I am keenly aware that the success of my bracket and any team’s ability to ascend to the Championship comes down to how well players perform under pressure. This leads me to ask an important question for the sake of science (let’s face it, it’s really for the success of my bracket and perhaps yours): What is it that allows humans to execute a series of learned behaviors at peak performance under stress? Fascinatingly, sports and athletic endeavors of excellence allow us to ask this question and make observations in a relatively controlled environment. Let me take you back to a crushing but incredible memory for many Tar Heels. It was a dark night on April 4th, 2016 and my boys (during the month of March I refer to the Tar Heels as “my boys,” bear with me) were playing Villanova in the Championship game. With seconds to the finish, my main man Marcus Paige shot a three-pointer and the CROWD WENT WILD. Three seconds later, Villanova responded and dreams were crushed, babies were no longer to be named Marcus Paige, and bonfires were doused. HOWEVER, THAT IS NOT THE POINT. Within the last ten seconds of this harrowing game, two teams had the ability to hit three pointers within mere seconds of each other in the Championship game. Was it nerves of steel? Was it sheer grit and determination? Was it just basketball destiny that we were to fall so that we may rise again in 2017? As I thought back to Marcus, I reflected on what many psychologists and behavioral scientists consider a critical facet in performance: balancing eustress and stress. Frankenhouser first introduced the term “eustress” in 1980 and denoted it as a positive type of stress, the kind of motivation that enables you to use that nervous feeling or mild anxiety and channel it into positive outcomes. Eustress differs from the negative form of stress (also referred to as distress) in that it is a low underlying level of stimulus rather than acute and sudden stress. How does this act of balancing eustress with distress actually work? So as it turns out, that low to moderate levels of controlled stress (e.g. consistent exposure to high stakes games but at regularly paced intervals) can really help mediate this balance. In addition, eustress is most present when there’s considerable joy experienced by the expended effort (e.g. you really love the game). Let’s think back to our scenario, both UNC and Villanova are big-name teams. These so-called “blue-bloods,” are the schools that consistently make it to the top 32, top 16 or even the Elite Eight year after year. This means that there’s substantial exposure to this environment over the course of a player’s career, and more importantly, senior players pass down these experiences to the incoming recruits. Both teams also have notorious rivals that push and magnify even regular season games to be of tournament calibre. So, in part this explains how both of these teams were able to place outstanding shots with 10 seconds left in the game. However, you may say, is that the only factor here? Did Marcus Paige truly abandon all distress in the face of Villanova to bring us back on the scoreboard? I believe in addition to moderate levels of consistent NCAA exposure, there was an important secondary factor in play for Marcus. If we really break down how I think peak performance is achieved, we have to consider how fear and anxiety are accepted and internalized. We just discussed eustress and practice theory, in which you overcome stress and channel it into eustress with consistent hard work and exposure. But what if you can’t do that? What if the acute distress is truly overwhelming? I would like to bring in a non-basketball example for a brief moment to really drive this point home (yes, I will use basketball puns all day err’day in this article). Recently, National Geographic released a documentary on Alex Honnold free climbing El Capitan (the death tower of granite in Yosemite Valley) without any ropes or gear. Most people would cringe at the mere thought of this venture and some, myself included, may just pass out from the dizzying idea of plummeting 3000 feet. However, Alex did his climb successfully and with an immeasurable amount of calmness. When interviewed, he stated that it wasn’t the lack of fear of dying that allowed him to perform these feats. Rather, it was an acceptance and compartmentalization of that fear and the acceptance of the outcomes of failure. I think what makes peak performance under stress truly possible is a combination of training along with internalization of fear. What’s most important in a stressful situation is acceptance of distress, taking control of it, visualizing the possible outcomes, and being okay with moving forward. That said, it’s very well possible that in those final moments of that game against Villanova, Marcus Paige saw the final seconds of his college basketball career and accepted that situation, found joy in it, and made a career-defining move. The Tar Heels and March Madness have taught me a lot of things, but above all, they have taught me a lot about how stress and anxiety can be channeled into productive outlets and how to rise above the pressure to try to do your best when you can. As Coach Roy Williams would say, “That’s a pretty daggum good basketball team.” Yes, I did watch a 1-minute sports clip of all of Roy’s choice game interviews to come up with that for this article, but he’s right because they are able to play well under pressure. I can’t wait to see how March Madness will conclude this year and look forward to see who will rise to become champions. Peer edited by Keean Braceros.